Written by: Jennifer Redelle Carey on February 22, 2013. 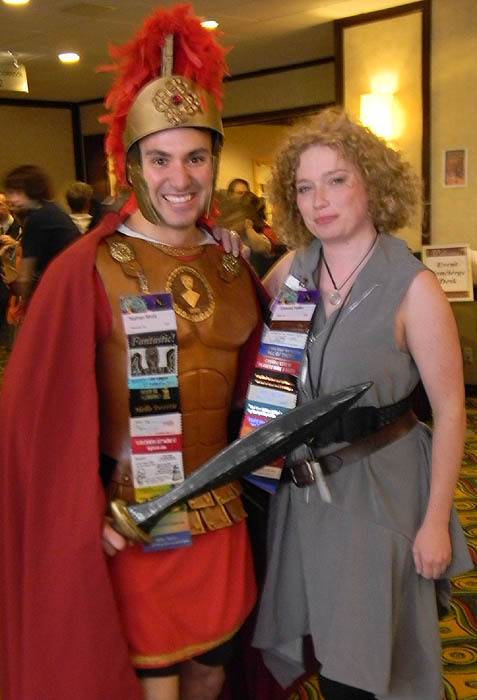 Here are some of my favorite cosplayers I came across during the 24th annual Gallifrey One (a Los Angeles-based Doctor Who convention) that happened President’s day weekend. I am a big fan of the new Doctor Who series, and especially the Ponds. I was very impressed by the variety of costumes this year. 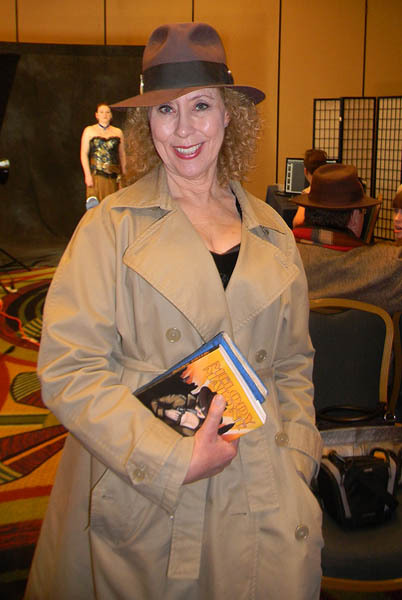 This is River Alexandra Song dressed as Melody Malone from “The Angels Take Manhattan.” I met her at WonderCon last year and I adore her cosplay! She is the best looking River Song I have seen. 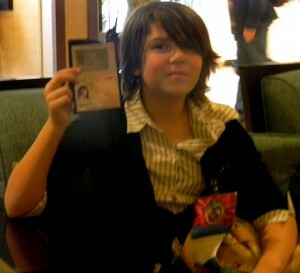 She even has an authentic TARDIS diary that she made. Here we have my favorite Jamie McCrimmon (I have seen him at all four Gallys that I’ve been to) and my favorite First Doctor. 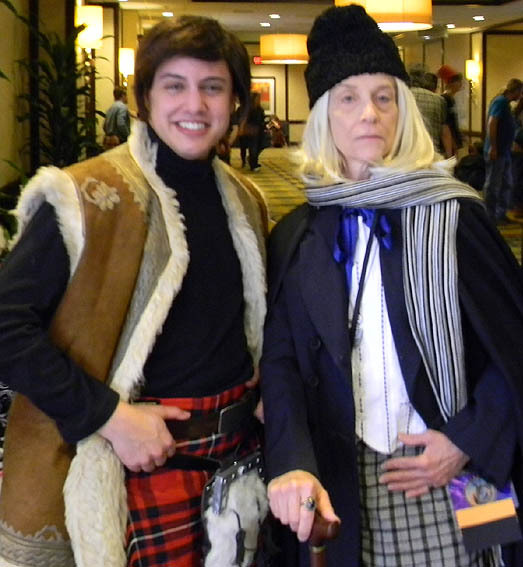 I saw her cosplay as the First Doctor last year as well and between her look and her costume she really captures the First Doctor’s character very well. How about some love for Canton Everett Delaware III! Canton is one of my favorite characters from the Eleventh Doctor’s tenure. And come on, how can you not love a character played by Mark Sheppard (AKA the man who is in all of your favorite fandom universes)? Here we have the Tenth Doctor holding his own severed hand. 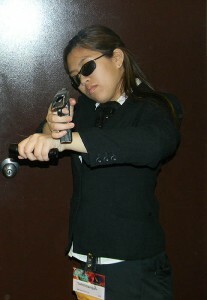 Cosplayers are ingenious and clever. 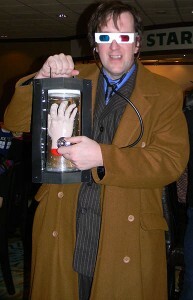 This Tenth Doctor cosplayer created the hand himself! He also made use of his Ten attire for a totally different costume, because I snapped him earlier in the weekend as a newly-minted Eleven! 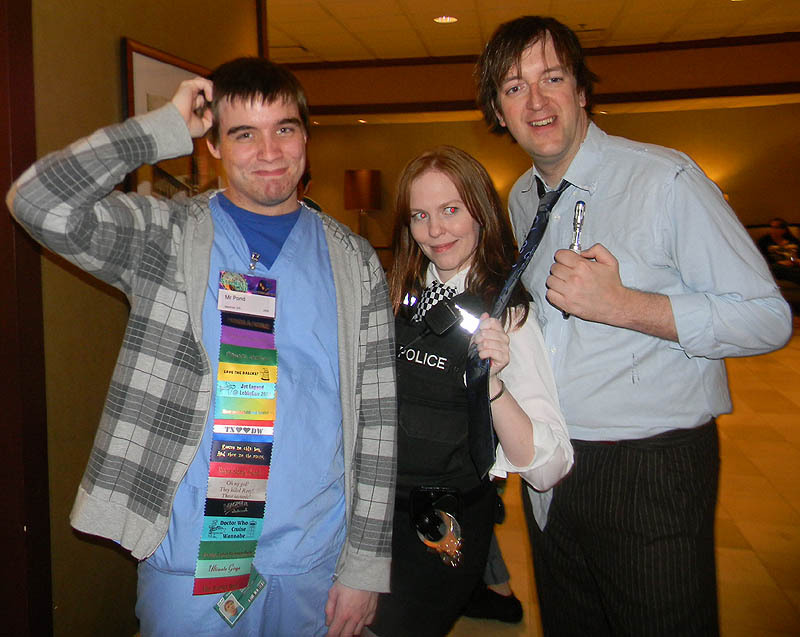 Being a fan of the Ponds, this trio homage to “The Eleventh Hour” was definitely a favorite of mine for themed costumes. I love how in character they are, especially Amy. She cracks me up. 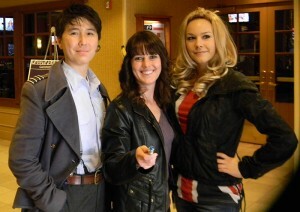 Now another trio homage that ties for my favorite homage cosplay are these three! Captain Jack Harkness, The Ninth Doctor, and Rose Tyler from “The Empty Child” and “The Doctor Dances.” The banana barrettes were a nice touch for the Ninth Doctor. One of the Ninth Doctor’s lines from “The Doctor Dances” is about bananas: “I like bananas. Bananas are good.” This Captain Jack Harkness also has one of the most amazing coats for Captain Jack that I have ever seen–and she made it herself. Here is a trio of cosplayers I got a snap of while my friend and I were resting outside the con suite and by the pool. 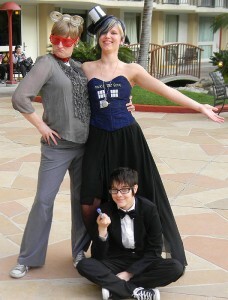 Here we have a stylized K-9, TARDIS, and the Tenth Doctor from Voyage of the Damned. 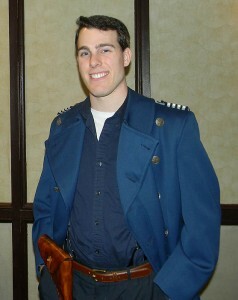 The TARDIS cosplay is one of my favorite interpretations that I have seen of a TARDIS costume. The blue in her hair was lovely and I adore the bodice and skirt. 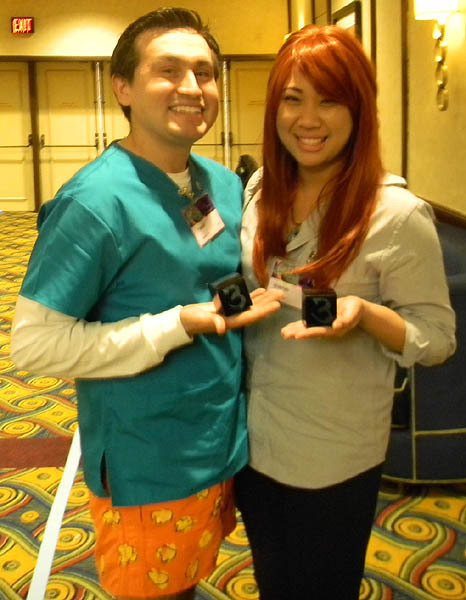 These two made up one of my favorite cosplay sets during the whole weekend: Rory Williams and Amy Pond from the episode “The Power of Three.” To accompany their outfits, they made little black cubes (a focal point of that episode) and were giving them to people! Inside the cubes they had included their twitter names. I thought it was a great touch and a fun way to engage in social media. The cosplayer playing Amy also actually sounded like Karen Gillan, but with an American accent. This cosplayer wins most creative costume; she is dressed as one of the Doctor’s trustiest companion, his Sonic Screwdriver! 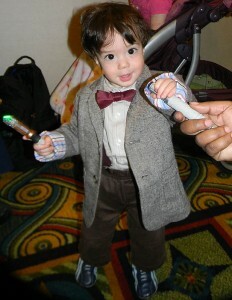 Even kids cosplay at Gallifrey! This girl is dressed as Harriet Jones, Prime Minister! 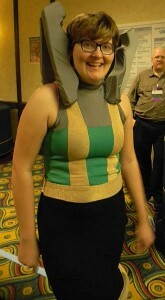 I also met her father when I was at Gally. He is a part of Sontaran Stratagem, A Doctor Who tribute band. You never know who you’re going to meet at Gally! I saw many a wee one who had been dressed up by his or her parents, but this baby Eleventh Doctor was too adorable for words! It makes a girl want to have a kid just so I can dress him or her up too! 😀 I love that Gallifrey offers a family friendly environment. I haven’t really seen this done at other conventions I’ve attended in the past.